The old bus station will be pulled down and moved closer to the Metrolink stop to create a train, tram and bus hub for the town. 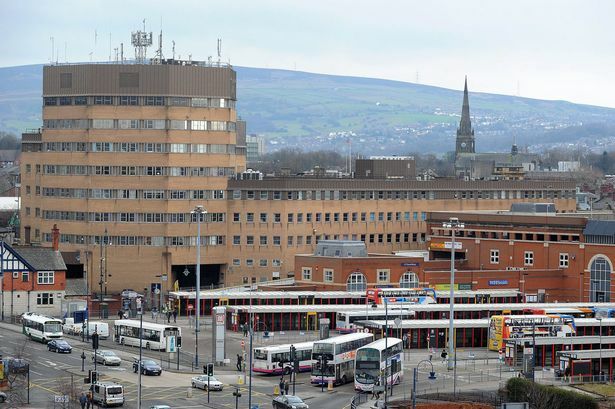 Plans to transform Ashton bus station into a £33m transport interchange have been revealed by travel bosses. The project will see the old station completely rebuilt and moved closer to the new Metrolink tram stop, providing better access between the two by the end of 2017. With the newly redesigned train station opposite, Tameside Council says that the project will play a key part in the town’s regeneration. Council leader Councillor Kieran Quinn said: “This is great news for Tameside as it means we are at the forefront of the key regional infrastructure projects earmarked as part of the Greater Manchester Growth Deal. Further details of the town’s hub come just days after the Greater Manchester Growth Deal, which set out a £470m investment partnership programme between the region and the government that supports economic growth throughout the county. This entry was posted in Ashton-under-Lyne Blog on July 11, 2014 by rogerfarnworth.